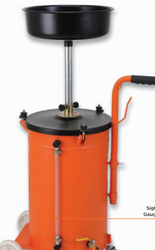 Pioneers in the industry, we offer waste oil drain gravity feed and waste oil drain - pressurized from India. Due to our devoted professionals, we have been capable to proffer a wide range of Waste Oil Drain Gravity Feed. These are available in different specifications that meet on patron demand. & power steering fluids etc. comes complete with a 14"
can be adjusted from 45"